[Archive] - Thank You For The Music! In 1992 St Andrew's Players' Committee invited Mike Hymas to become the Society's first President. The previous year had been a turbulent one and we were bruised and depleted. There was no job description; all we wanted was someone with an interest in musical theatre that would be a good friend and supporter to the Society. To our delight, Mike accepted with enthusiasm and proceeded to make his Presidential role one that we all truly respected and greatly valued throughout his ten years of office. Mike presided over one of the most artistically and financially successful periods in the Society's history. Harrogate St Andrew's Players (HSAP) started life in 1969 performing in St Andrew's Church Hall, staging at least one show every year since and, for the last twenty years or so, two. The Society progressed from Church Hall to School Hall to Royal Hall and finally settled in our current venue, Harrogate Theatre, in 1997. Firstly was a generous financial support, which Mike never liked to be acknowledged in any "public" votes of thanks, such was the low-key profile that he preferred. But he was passionate in his wish for us to succeed and determined to give us all the opportunities he could. We much appreciate the continuing interest and support by Mary and her family. Secondly was the significant contribution of time that he gave to the Society and its activities. Anyone who knew Mike was well aware of his very long working day but nevertheless he attended virtually all our monthly Committee meetings. His business acumen and common sense advice were invaluable and he gave them freely when asked. Unfortunately some of these meetings can run pretty late, and it wasn't unknown not to catch Mike dozing off during a particularly boring discussion! Mike also attended every performance of every show (unless he hadn't consulted with Mary early enough and she had arranged a holiday!) and was a familiar figure in smart dinner suit taking on his alternative career of doorman! After the final performance of "Hello Dolly", that same dinner suit could be seen at 2am, soaking wet on the President loading the set on to the wagon - Mike helped with every get-out at the Theatre until the wagon door was shut! He enjoyed hosting his President's Guest Nights annually but was just as happy selling programmes or raffle tickets, assisting with programme advertising or attending external meetings - whatever needed to be done! Thirdly was Mike's enthusiasm for and loyal commitment to HSAP. There is no doubt that Mike got a great deal of pleasure from his involvement with our particular brand of entertainment and had great faith in our continuing success. He shared our delight in being asked to perform the midnight cabaret at the NODA North Fast Conference in 1998. He used to unobtrusively slip in to rehearsals and enjoyed watching the progress of the productions as the MD or Director put us through our paces. He even sat through dress rehearsals despite the despair these can sometimes generate! In 1995 Mike asked the Committee if they would have any objections if he introduced a 'President's Award" for an actor/actress in a supporting role. Thereafter he presented an engraved shield annually to his choice for this award - an accolade eagerly anticipated by the company on the last night! Mike was immensely proud of the professionalism and high standards achieved by HSAP. He was integral to the team that established a base for the dynamic, thriving and vibrant Society we are today. Our testimonial to him is to continue striving for excellence and innovation. At our committee meeting last January, Michael asked me when the Band was next likely to qualify for the Finals of the National Brass Band Championships. We had recently been promoted to the Championship Section - the 'premier league' of band competitions - so had taken a huge step forward; I feared it would be some time before we would enjoy the same successes as previously. I suggested that it might take five years before we might challenge for a place at the Royal Albert Hall, but seeing the expression of disappointment on Michael's face I quickly revised my estimate: "but if we push ourselves really hard we might be able to do it in three years". We have now made three CD recordings (on sale today! ), and each represents a milestone in the Band's development. The first recording was an ambitious project but Michael removed the financial risk for the Band by pre-ordering copies for his friends, customers and clients. In recognition, we included his favourite, Jesu Joy of Man's Desiring amongst the tracks. Michael was always a keen supporter of our tours; he enjoyed the travel, the company and the chance to hear the band play in front of new audiences; he travelled with us to Prague and Holland and the Albert Hall, and through his friendship with Malcolm Wray the Band enjoyed first class travel arrangements. Like any group striving for success, the Band recognised that it needed resources of a considerable quality to achieve and maintain high standards. Michael fully supported our application to the National Lottery and did everything necessary to ensure that an award (which enabled us to buy a complete set of new instruments and a trailer) was successful. 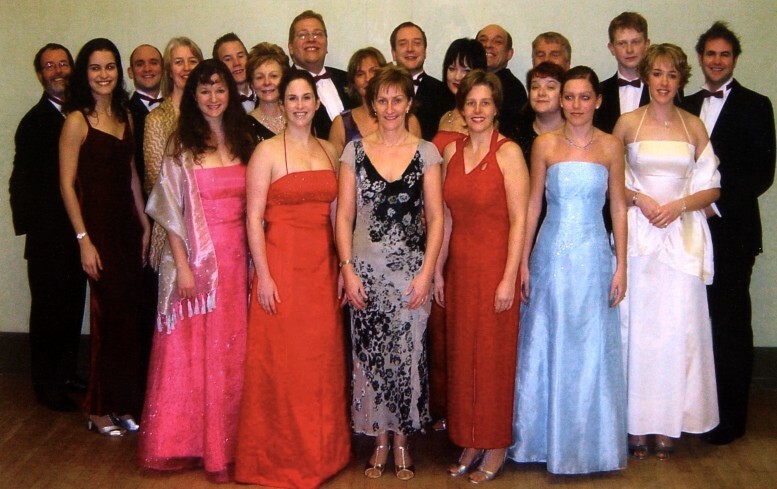 The Harrogate Band isn't just about hard work - we enjoy a lot of fun together; and again Michael was at the centre. The social evenings at the Bandroom were always helped along by a supply of beer from Daleside Brewery, thanks to Michael, and in the summer Mary and Michael would open their lovely garden to welcome home the winners and losers from our annual Treasure Hunt. The Harrogate Band continues to thrive and work towards future successes: Michael Hymas has helped us to build upon strong foundations. 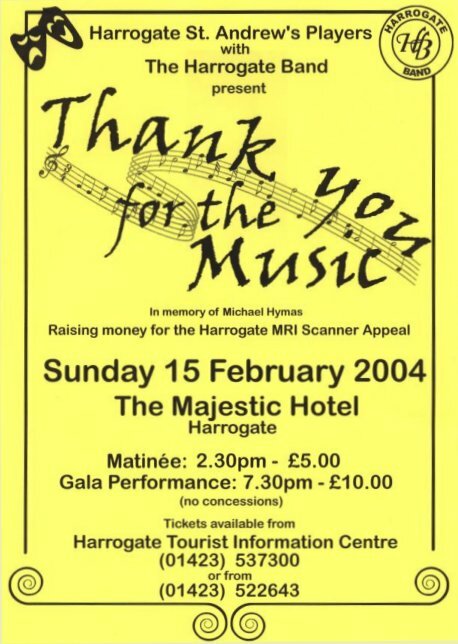 We travel around the country performing in concerts and competitions, we have a significant presence on the World Wide Web (please visit us at www.harrogateband.org) and a growing audience, many of whom have already joined our new 'Friends of Harrogate Band' group, and we're always happy to receive offers of help, whether financial, practical or just shaking a collecting tin on a Sunday afternoon in the park. The Band is extremely grateful for the support it continues to receive from Readydrive and the Hymas family.